Found some more info on a historic paddle in the Toronto Reference Library Archives. This one is a full sized souvenir paddle which eventually ended up in the National Museum of Ireland. It was made for Colonel Jasper Grant, an Anglo-Irish Officer stationed in the Eastern Great Lakes region between 1804 - 1809. 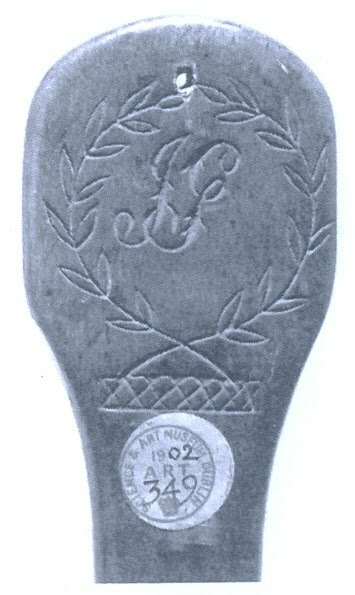 The grip on the paddle is a shortened, flattened style grip which includes an etched wreath decoration surrounding his initials. 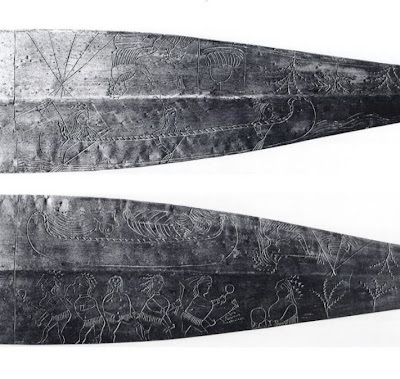 Both sides of the blade a decorated with depictions of native scenes including dancing men with tomahawks, a solitary man with a tripod and cooking pot, and some figures paddling a canoe. One freight canoe has what looks like an HBC flag at the stern, you can just make out the cross marks of the Union Jack.